The Double Ended 67 inch acrylic bathtub will surely be the center point of your bathroom. The double ended design allows either end to be used. Modern and vintage designs are merged together with the pedestal base. With 7 inch faucet drillings on the tub rim, the tub filler can be mounted directly to the tub. With elegant looks, the Fusion Freestanding acrylic tub transforms your bathroom into a personal spa. Relax comfortably with the classic slipper design in a durable acrylic tub constructed. The bathtub includes waste and overflow and holds up to 52 Gal. of water for a spa like experience. Double Slipper 6 ft. 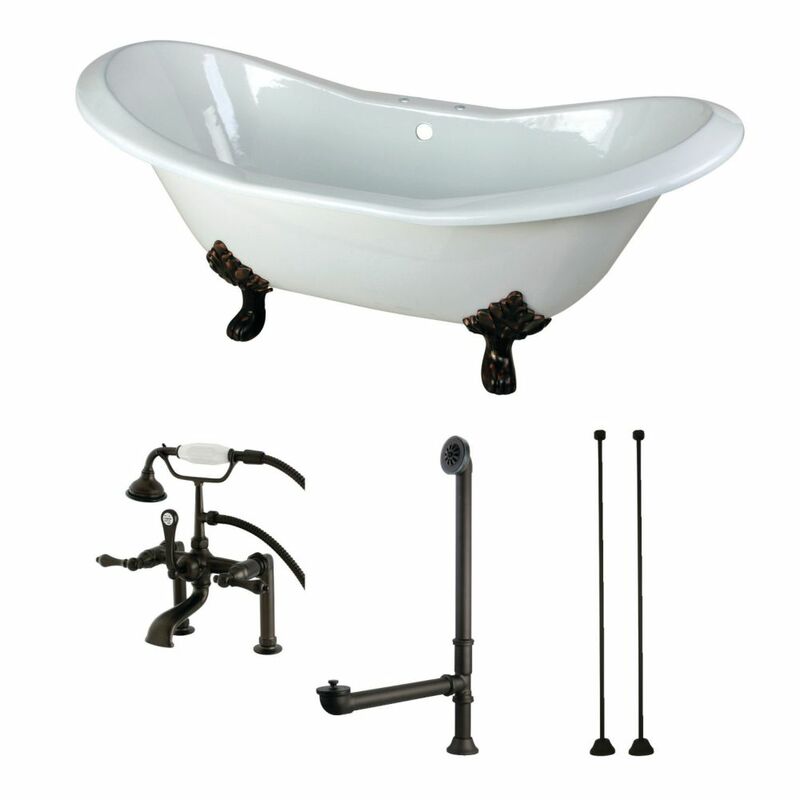 Cast Iron Clawfoot Bathtub in White and Faucet Combo in Oil Rubbed Bronze The classic Double Slipper cast iron claw foot tub adds a vintage touch to your home bathroom. With timeless styling and ornate tub feet, this tub will provide warmth and durability because of its cast iron construction. Combo set includes tub, faucet, drain and supply lines. Double Slipper 6 ft. Cast Iron Clawfoot Bathtub in White and Faucet Combo in Oil Rubbed Bronze is rated 5.0 out of 5 by 2. Rated 5 out of 5 by LL from Beautiful tub but we didn’t receive the proper overflow gasket... Beautiful tub but we didn’t receive the proper overflow gasket and are having difficulty procuring one. Otherwise the quality seems top notch.